Saturnalia Productions rents the Fujinon 22x7.3mm HD lens. We ship HD lenses, HD cameras and other rental equipment to anywhere in the world from our rental / production office in Los Angeles, California. The Fujinon 22x7.3mm HD lens is best suited for telephoto / tripod work. It's 22x magnification and 2x extender allow for an impressive maximim focal length of 321.2mm. 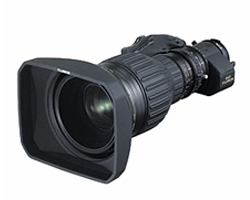 This Fujinon 22x7.3mm zoom lens is a favorite HD lens rental for producers of independent features, concerts and sporting events. Please keep in mind that Saturnalia Productions can aslo provide all of your HD crew needs, no matter the size of the job. Our personnel have focused solely on HD production since 1999 working for clients such as Lucasfilm, CBS, BBC, ESPN, Disney and WB. Our technical producers, directors, video engineers and camera operators are among the most experienced in the world. One of our specialities is multi-camera production using either fiber back Sony F900 cameras or fiber back Panasonic AJ-HDX900 cameras. We rent both of these fiber back HD camera systems. Our services are a la carte, so you may choose to simply rent a Fujinon 22x7.3mm HD lens from us, if you wish.